These people are probably using heirloom gear. 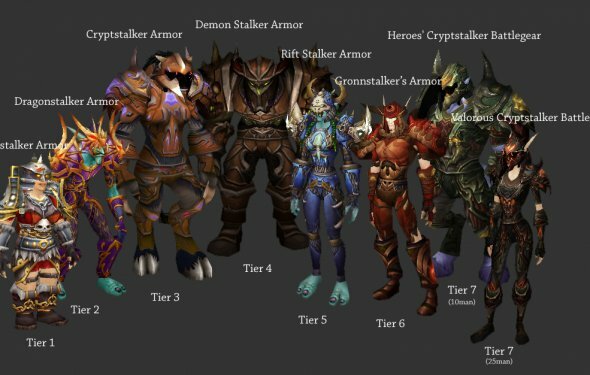 Heirloom gear is bought from either the vendor in the hall of legends in orgrimmar (the horde capital city, top of the durotar zone) for honor points (gotten from pvp) or the vendor on top of hellscreams tower, building, also in orgrimmar, for Justice points (gotten from level 75-85 dungeons). Heirlooms are pieces of gear that never break, have stats that get better depending on what level you are, and grant 10% bonus experiance for each piece you have on. Players can transfer these heirlooms to any one of their toons on the server that you bought it on, regardless of the faction that toon is on. You can get these pieces with a lot of pvping at lower levels, but it is much easier to get them when you are a higher level. Basically, if you are getting your gear in dungeons, then that is the best gear you can be getting right now. When you get to the level where heirlooms are more easily obtained, then you can go out and get some for leveling a different class if you so choose. Dont worry about it now though, you should be fine. I didnt check your gear to see if you were getting the right stats, basically for a hunter you want leather gear with agility on it, and when you get to level 40, mail armor with agility on it. Agility is a hunters best stat, so always choose that over everything else.